This outfitter has been exploring Utah on horseback for over 30 years. She takes riders on multi-day camping and inn to inn rides through some of Utah’s most stunning national parks and areas for viewing wildlife and wild horses--- like Capital Reef National Park, a land roamed and settled by ancient native Americans, Mormon pioneers and famous outlaws like Butch Cassidy. The trail trips focus on scenic and distinctive land formations in the middle section of the Colorado Plateau, the last explored region of the continental United States, bound by the south side of the Grand Canyon. A Navajo Indian legend describes the area as, “the land of the sleeping rainbow”. To trail ride this terrain and take in the panoramas of the “sleeping rainbows” breaking from the lush alpine plateaus looming high above is indisputably the opportunity of a lifetime. Sensitive to the fragile environment, this outfitter implements low-impact camping techniques, small group sizes, well-maintained equipment, and top-notch horses. You will have access to rugged and scenic landscapes of immense scale, with an unencumbered and comfortable ambiance where you can relax, refresh, and rejuvenate prior to your next day’s adventure. As an owner operated facility, guests receive personal attention and service while exploring the backcountry of the Colorado Plateau. Riders may choose from to camp out at a deluxe basecamp or stay in comfort at night on an inn-to-inn adventure. This outfitter strives to give experienced riders all the pace and challenge they desire, and to give inexperienced riders all the instruction and patience they need. Time and logistics permitting, she often divides into two groups riding to separate destinations or scenic features. Non-riding companions are welcome on all trips. These backcountry adventures have been featured in many prestigious publications including the New York Times, National Geographic Explorer, Sunset Magazine, Time magazine, and Western Horseman. Observers have lauded their guide service for its educational value, and the experience and professionalism of their crews. Please see Equitrekking Travel’s general packing list and Hondoo’s suggestions below. Personal articles you should pack include a towel, riding helmet (optional item except for riders under l8 years of age although all riders are encouraged to wear helmets), chaps and swim wear (optional), a camera and plenty of film with a padded travel case, a flashlight, extra batteries, dark glasses, sun screen, and insect repellent (Avon's Skin-So-Soft is the only thing that repels the small gnats Pat sometimes encounters). This outfitter provides sleeping bags, saddle bags, a day pack, helmets (some sizes are available). There are four national parks in the area, museums, and a highway designated as one of the top 10 scenic highways in the U.S. Variety in terrain is the primary attraction to the area, along with ideal temperatures throughout the season. Fly-fishing, hiking and rafting are area favorites. For the trips that feature camping, guests sleep in tents at primitive sites that are supported by four-wheel drive vehicles. The camp wagons brings what is needed for cooking, eating, a shower tent, chairs and commode, as well as feed for the horses. Guests stay in small tents for single or double occupancy. A base camp is the setting for most rides. Sleeping bags and a six-inch foam sleeping pad or cot are provided, along with water bottles and quality tack. The first night guests stay in Torrey. For the Capital Reef Trail, guests stay at small Bed & Breakfasts or lodges. Boulder View Inn is one example. Its modern facilities include in-room phones with free local calls, free high speed Internet, and television. The menus consist of fresh food featuring organically raised beef. Appetizers, salads, and a starch make vegetarian meals easy to accommodate. Vegan diets are more of a challenge, but gluten sensitivities can be worked out with prior notification. Meals are included in the price, starting with lunch on the 2nd day through lunch on the departure day. Beer and wine are accepted and welcome but not provided. With advance notice, wine or spirits for guests can be delivered. You may purchase beer and wine with meals in Utah. A corkage fee at restaurants is applied if you bring spirits purchased in Utah. No out of state liquor is allowed in restaurants. While no previous experience is required, participants should be in good health and physical condition. These horse vacations are designed for horse loves. An appreciation of the outdoors is the only prerequisite for joining a trip. Single Supplement on Inn-to-Inn Trailrides is $350 for 6 nights at the resorts. Trips feature complete outfitting, all lodging, meals and transportation from Torrey, Utah. Everything you'll need except personal accoutrements. Optional Inclusions: Transfer from Salt Lake City or St. George, Utah. 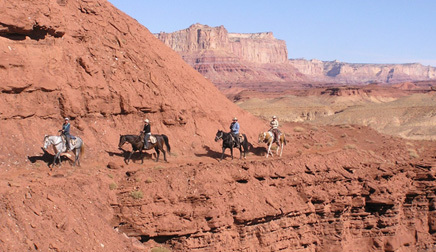 Inn-to-Inn Trailrides depart from Torrey, Utah. Torrey is a town of a little over 200 population, which is located at the junction of State Highways 12, and 24 near the west entrance of Capitol Reef National Park. We use one of the areas three best inns for lodging our guests during the rides first three nights. You will lodge at Torrey Schoolhouse B & B, The Lodge at Red River, or Muley Twist Inn. The inn used will be specified with confirmation of ride reservation. Inn Rides end in Boulder, Utah. Boulder is a tiny town with big scenery. It is famous as the last town in the continental United States which could be reached by automobile 1938. It is located on Highway 12 named by AAA Auto Club as one of the three most scenic roads in America forty miles south of Torrey. Lodging is quite scarce; we'll stay at either the Boulder Mountain Lodge or Pole's Place for our last three nights based on availability. Day 1 Arrive scenic Torrey, Utah and check into your assigned lodge. Participants on Inn-to-Inn rides will meet with your trip leader and interpretative specialist for orientation and to outline details, destinations, and scheduling particulars at 8:00pm at your assigned lodge. Day 2 Your guides will meet you after breakfast at your inn and then you'll depart for a short vehicle ride to the trailhead meeting the remainder of the crew and your horse. After becoming familiar with your mount, you'll hit the Sand Creek Trail for The Mummy Cliffs and Fremont River Overlook, Hell's Hole and Paradise Overlook or you'll ride along Pleasant Creek as you pass through the Waterpocket Fold in Capitol Reef National Park. Day 3 From your Torrey inn, you'll visit Sulfur Creek Gorge and The Goosenecks; or you'll ride the Keller Trail to Capitol Reef Overlook on Chokecherry Point and The Terrace. Day 4 Today your accommodations will shift from the Torrey area to Boulder, Utah. For those guests traveling by automobile, you'll transfer car and luggage to trails end then go in the van to today's trailhead and ride The Slickrock Trail or you'll ride The Great Western Trail to The Terrace and Meeks Lake. Follow the vehicles to your new accommodations with plenty of time to unpack, relax and enjoy a distinctive dining experience with your guide before bedding down. Day 5 From our Boulder base, you'll experience the Burr Trail into the Escalante river canyons of Sand Hollow and Deer Creek or you'll ride from Roundup Flat Trail to Long Lake, Scout Lake and Sunflower Flat. Day 6 You'll depart for a final day of riding joining your mount in Indian Gulch, then journey to The Lamp Stand, Lamanite Natural Bridge and Egg Canyon or venture to Edmund's Hole, Steep Creek Lakes and Deer Creek. On this final evening, you'll enjoy a group dinner before your final night's stay. Day 7 Depart Boulder, Utah. *Note: This is a flexible sample itinerary for two of several camps you may use and is subject to change if it is in the best interest of the riders and horses due to weather, group size, or any other necessary reasons. Each camp is unique and often offers more trails to explore than time will permit. Single Supplement Camping Trailrides—$50 for 1st night inn lodging & single tent. Note: This is a sample itinerary for two of several camps. Each camp is unique and often offers more trails to explore than time will permit. Day 1 Arrive scenic Torrey, Utah and check into your motel which will be specified with confirmation of ride reservation. Torrey is a town of a little over 200 population which is located at the junction of highways 12 and 24 near the west entrance of Capitol Reef National Park. At 8:00 PM we meet at the Inn for an orientation and final packing session with your trip leader and the trip’s interpretative specialist. Day 2 After breakfast, you’ll travel a short distance down the road to the headquarters, located on highway 24 in the middle of downtown Torrey. At Hondoo’s office and gift shop, we’ll pack your gear in the camp 4X4, meet the remainder of the crew and your horse, then depart for our trailhead. The 25 mile ride through the Reef whets your appetite for riding through the seemingly impassible slickrock canyons. From the trailhead you’ll ride past a 4th generation farm along Pleasant Creek, through a labyrinth of variously colored cliffs and canyons, past the Pioneer register, and the old corrals and buildings that are all that’s left of the Sleeping Rainbow Ranch. Ponderosa pines, Navajo sandstone domes and a frosty drink welcome you at the basecamp. Day 4 With a hearty breakfast under your belts and an early start, you’ll gradually leave Pleasant Creek, pass through Tantalus Flats and over the divide into Sheets Gulch, traipsing where prospectors from the 50’s hoped the needles on their Geiger counters would signal a lucky strike. Once we make our way into the gulch, we’ll be rewarded by the shady cottonwoods and monkey flowers. The route back will allow us to relish the backlit pink and purple hues on the Chinle and Navajo cliffs. A welcomed meal and relaxation around the evening campfire round out the day. Day 5 After finding your way through the labyrinth of canyons which comprise the tributaries of Pleasant Creek we’ll have the opportunity to see the eroding pictographs and Fremont pit houses of Spring Canyon. En route back to camp you’ll have numerous opportunities to imagine the challenges that faced 19th century pioneers at stops at the Nixon canyon and Miner’s mountain cabins. Day 6 Departure day. After packing personal gear and breaking camp, you will ride the length of the Sulfur Creek to the Slickrock trail. Rendezvousing with our vehicles at Grover, you’ll exchange your saddle seat for the cushioned comfort of a short vehicle ride along highway 12 . You’ll arrive Torrey late afternoon. Day 1 Arrive scenic Torrey, Utah and check into you lodging which will be specified with your reservation. Torrey is a town of a little over 200 population which is located at the junction of highways 12 and 24 near the west entrance of Capitol Reef National Park. At 8:00pm meet at the lobby for an orientation and final packing session with your trip leader and the trip’s interpretative specialist. Day 2 After breakfast, you’ll travel a short distance down the road to Hondoo’s headquarters. Hondoo’s headquarters are located on highway 24 in the middle of downtown Torrey. At Hondoo’s office and gift shop, we’ll pack your gear in the camp 4X4, meet the remainder of the crew and your horse, then depart (9:00am) for our trailhead at Roundup Flat or Circle Cliffs. The 30 mile ride over Boulder Mountain on highway 12 travels along a stretch of road which AAA of California has rated among the top ten scenic drives in America. From the Roundup Flat trailhead you’ll ride past the Steep Creek Lakes and the Windmill into Indian Gulch via The Stairs before arriving at the Gulch basecamp. From the Circle Cliffs trailhead with it’s panoramic view of the Grand Staircase and Escalante Canyons, you’ll leave Studhorse Peak and Wagon Box Mesa behind as you ride to basecamp at Moody Canyon or nearby Silver Falls Canyon. Day 3 After breakfast and preparing lunch, from the Gulch basecamp you’ll visit Lamanite Natural Bridge, Water Canyon and Egg Canyon before returning home to a hot shower and cold drinks. From the Moody/Silver Falls basecamp, you’ll ride over the Purple Hills to explore the labyrinth of canyons which comprise the Moody Canyon complex. Day 4 Daylight at the Gulch camp brings the prospect of visiting the Circle Cliff divide, the Lampstand and the petroglyphs located at its base. From the Moody/Silver Falls camp you’ll wind your way into the ever narrowing depths of Silver Falls Canyon with stops at the Pioneer Register and the cooling alcove at Immigrant Springs Peak. Day 5 From the Gulch camp you’ll explore the upper reaches of Indian Gulch where it emerges from Edmund’s Hole under the Windmill or Impossible Peak. Or, after a hearty breakfast, you will ride to Deer Point, the Capitol Reef Divide and the Waterpocket Fold Overlook before returning to relax around the evening fire. Day 6 Departure day. After packing personal gear and breaking camp, you will ride the length of the Gulch to where it joins Steep Creek and Long Canyon. At Long Canyon you’ll exchange your saddle seat for the cushioned comfort of a vehicle ride along the Burr Trail road to highway 12 and beyond. You’ll arrive Torrey late afternoon. Day 1 Arrive Scenic Torrey, Utah and check into your lodging which will be specified with your ride reservation. Torrey is a town of a little over 200 population which is located at the junction of highways 12 and 24 near the west entrance of Capitol Reef National Park. At 8:00pm meet for an orientation and final packing session with your trip leader and the trip’s interpretative specialist. Day 2 After breakfast, you’ll travel a short distance down the road to Hondoo’s headquarters. Hondoo’s headquarters are located on highway 24 in the middle of downtown Torrey. At Hondoo’s office and gift shop, we’ll pack your gear in the camp 4X4, meet the remainder of the crew and your horse, then depart (9:00am) for our trailhead near Penitentiary Canyon or at the Head of Sinbad. From the Penitentiary trailhead you’ll ride to the mouth of Red Canyon, then to Tomsich Butte, then to Hondoo Arch, and then on to our basecamp at the old mining camp on Muddy Creek. From the Sinbad Trailhead you’ll visit Locomotive Point, Devil’s Race Track, Twin Priests and the Golden Gate before arriving at basecamp in Cold Canyon. Note: most days of the trail ride, you should see mustangs or desert bighorn sheep. Day 3 After breakfast and preparing lunch, from the Muddy Creek basecamp you’ll visit Red Canyon Narrows, Courthouse and Family Buttes or The Chute and Penitentiary Canyon before returning to camp situated under majestic cottonwoods along the picturesque stream. From the Cold Canyon basecamp you’ll ride thru the Golden Gate to Bullock Canyon and the Blue Man pictograph panel, then on to the South Fork of Coal Wash and the pictograph panel there before returning to the hot showers and cold drinks at the slickrock canyon basecamp. Day 4 From the Muddy Creek camp you’ll explore the upper reaches of the Muddy Gorge where it meanders through the splendidly colored slickrock of Triassic sandstones. Mustangs are numerous along the stream where they come for water from their pastures in the deep side canyons. From the Cold Canyon location you’ll ride to the Long Neck for views of Swasey Arch, Saddle Horse Canyon and upper Cold Canyon. After lunch, you’ll ride up the McCarty Canyon trail to the head of Mesquite Canyon where a promontory point will provide a striking vista encompassing all the country you’ve covered during your trip. Day 5 Daylight at the Muddy Creek camp brings the prospect of visiting the magnificent Chute Gorge and Chimney Canyon. From the Cold Canyon basecamp you’ll ride to the pinnacles of Devil’s Monument and Joe and his Dog then on the return to camp you’ll stop at the historic outlaw camp and mining ruins at ZCMI mine. You should note that you will always arrive back at camp with plenty of daylight and time to clean up and enjoy hors d’ oeuvres before dinner. Day 6 Departure day. After packing personal gear and breaking camp, you’ll ride to McKay Flat via Red Canyon and the Grey Breaks. This route will take us to a favorite watering spring of the wild horses and furnish breath-taking panoramas of the country you’ve visited on your trip. At the McKay Flat or the Snake Dance panel you’ll exchange your saddle seat for the cushioned comfort of a vehicle ride over the San Rafael Swell to Torrey, Utah. You’ll arrive Torrey late afternoon. Day 1 Arrive scenic Torrey, Utah and check into specified lodging which will be confirmed with reservation. Torrey is a town of a little over 200 population which is located at the junction of highways 12 and 24 near the west entrance of Capitol Reef National Park. At 8:00pm meet at the lobby for an orientation and final packing session with your trip leader and the trip’s interpretative specialist. Day 2 After breakfast, you’ll travel a short distance down the road to Hondoo’s headquarters. Hondoo’s headquarters are located on highway 24 in the middle of downtown Torrey. At Hondoo’s office and gift shop, we’ll pack your gear in the camp 4X4, meet the remainder of the crew and your horse, then depart (9:00am) for the Slickrock Trail ten miles southeast of Torrey, or the Great Western Trail two miles north of Torrey. The Slickrock Trail leads to Happy Valley, Golden Throne overlook, Wildcat Gorge then to your basecamp on Pleasant Creek. The Great Western Trail will take you up Sand Creek to the Velvet Ridge, then to Hells Hole, Sand Creek Falls and your camp at Wiff’s Pasture. Day 3 After breakfast and preparing lunch, from the Pleasant Creek basecamp you’ll ride to Meeks Lake, Pleasant Creek meadows and the Boulder Top at Behunin Point before returning to a hot shower and cold drinks. From the Wiff’s Pasture camp you’ll ride to Snow Lake and the Flat Top on Thousand Lakes Mountain where the views of the canyonlands are indescribable. As always, you’ll return to camp in time to relax and enjoy hors d’oeuvres before dinner. Day 4 Daylight at the Pleasant Creek camp brings the prospect of visiting Scout Lake, Long Lake and spectacular Bowns Point via the Elderberry Trail. From the Wiff’s Pasture camp you’ll wind your way into Paradise in Capitol Reef National Park. After lunch you’ll return to camp via Billings Pass and the Cathedral Valley overlook. Day 5 Riders at the Pleasant Creek camp will follow Keller’s Trail to the breath taking vista on Chokecherry Point, then across the Terrace to Pleasant Creek Falls. After a hearty breakfast, riders at the Wiff’s Pasture camp will spend their final full day on the Saddle Pass Trail with it’s stunning views of Hell’s Hole, Sand Creek Gorge and the Fremont River Valley. Day 6 Departure day. After packing personal gear and breaking camp, riders will use the Slickrock Trail and return among the multi-hued Navajo sandstone domes littered with volcanic boulders where you’ll exchange your saddle seat for the short drive back to headquarters. From the Wiff’s camp you’ll take the Sulfur Basin trail to Torrey Knoll and the Bingo and Torrey town overlooks. After a short drive you’ll arrive Torrey late afternoon. "We 'old' gals had a great time and wouldn't have missed a day for anything in the world. We've since purchased stock in Aleve." "Horses were great, friendly and well behaved." "I woke up to the best wallpaper in the world!" "All my nervousness galloped away the moment we reached those amazing vistas and canyons." "The campsite was wonderful and well provided." "A very professional outfitter and their experience showed." Seasoned travel writers W. C. McRae and Judy Jewell know the best ways to experience all that the Beehive State has to offer. The authors include great trip strategies that utilize Utah’s amazing outdoor attractions and unique history, such as Standing High: The Best Vistas and The Old West Tour. Packed with information on dining, transportation, and accommodations, Moon Utah has lots of options for a range of travel budgets. Every Moon guidebook includes recommendations for must-see sights and many regional, area, and city-centered maps. Including expert advice on the state’s best brewpubs, first-rate ski and snowboard resorts, and amazing National Parks, Moon Utah gives travelers the tools they need to create a more personal and memorable experience. With expert writers, first-rate strategic advice, and an essential dose of humor, Moon Handbooks are the cure for the common trip. Roadside History of Utah takes readers on a journey through time as it follows the state's highways, vividly portraying the determined people who faced the challenges of making a home in Utah. Readers will meet them all: the native peoples, early explorers and traders, Mormon pioneers, miners and ranchers, and even today's developers. In addition to detailing the state's major historical events, author Cindy Bennett displays a love of Utah that casts a warm glow on her accounts of tiny settlements taking root and growing into amiable towns like Pleasant Grove, whose main landmark today is a hamburger joint called the Purple Turtle, and Richmond, home of Utah's first evaporated-milk factory. Bennett relates stories such as the terror of Bear Lake, where for years a 75-foot monster was believed to lurk until it was discovered that the disturbance in the water were caused by local cattle. These, and many more tales, are the compelling stories of Utah's exceptional people. This outfitter strives to give experienced riders the challenging pace they desire, and inexperienced riders the instruction and patience they require. Different riding levels are often divided into two groups, riding to separate destinations or scenic features at an optimal speed. No weight limit. Since altitude may affect some travelers, guests who strive for a good level of fitness and are somewhat active have maximum enjoyment on the trails. 8 yrs old. Private trips are best for families, so if you have a family that wants to ride, please contact us. The scheduled trips are not suited for young children. Helmets are required for riders under l8 years of age. 4-6 hrs of riding per day. Breakfast is served by 7:30 a.m. and you will be on the trail by 9:30. For the camping trips, you will return by 4:30 or 5 p.m.
Salt Lake City, Grand Junction, CO or Las Vegas, NV. Transfers from Las Vegas to St. George are available for an additional fee. Travelers are advised to rent a car, as this is most cost effective. Special Transfers from any location in the Inter-Mountain West may be arranged. Ground transfers from Moab or St. George, Utah are $370 per person with a 4 person minimum.